Jewelry Connection – Oklahoma City's best connection in jewelry since 1989! Jewelry repairs, watch repair, engraving, and watch batteries. If your jewelry needs some help, let us return it to its former shine! We offer a range of fine jewelry and gemstones to fit any customer’s needs. With years in the business of jewelry sales and repairs, we have a deep pool of experience and knowledge to draw from in order to best serve our customers. The Secret of Our Business..
Quality customer service – that’s what the Jewelry Connection has come to mean after so many years as Oklahoma City’s favorite jeweler. And that’s what you can always expect, every time you come in. We understand that purchasing jewelry for that special someone is always an important occasion, and that’s why we’re here to help you find the perfect ring, necklace, charm, bracelet or watch to tell that special person just how you feel. So stop by today and get the wonderful gift you’ve been searching for, and be pleasantly surprised by our exceptional service and unbeatable prices. Find your perfect jewelry today! Come in and let us help you find your perfect match! A word from the owner.. I have been in the jewelry business for 46 years. For 24 years, I worked for a large jewelry company here in Oklahoma City. 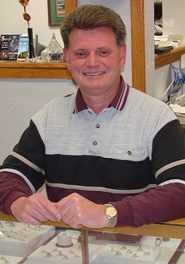 I started the Jewelry Connection in 1989, and for the last 29-plus years, I have focused on what my customers want, not the generic jewelry you see at store after store. My low overhead allows me to offer much lower prices on quality jewelry. We basically do most of the things the larger jewelry stores do. We offer total custom work, plus jewelry and watch repair for lower prices to our customers. We offer great services, that’s why 80% of my customers are referrals.